한국은 지금 다른 국가들처럼 신용위기를 겪고 있다. 깊어가는 경기 침체의 위험을 헤쳐나갈 수 있는 과단성 있는 대통령이 필요하다. 한 국가의 수장으로서 이명박 대통령은 자신의 존재를 입증해야 한다. 그렇지 않으면 치명적인 타격을 받는 것이 그의 평판만은 아닐 것이다. 나라도 큰 타격을 입을 것이다. 이명박 대통령이 11월15일 워싱턴 팔로마호텔에 마련된 프레스센터에서 G20 세계금융정상회의에 대한 기자설명회를 하고 있다. Ifrankly have been mystified at the arguments of those that seek to block the sending of leaflets and other material to North Korea. Their argument that the sending of this material by balloons into North Korea is damaging inter-Korean relations is spurious at best. More worryingly, their argument seems to be playing into the hands of the delightful leadership in North Korea. The same one which have murdered, tortured and improvised its citizens. 솔직히 말해서 나는 북한에 전단지 보내는 것을 막으려는 사람들의 주장에 미혹됐던 게 사실이다. 이 전단지를 북한에 보내면 남북관계를 훼손시킨다는 그들의 주장은 그럴싸하다. 그런데 우려스럽게도 이 주장은 북한 지도자들을 이롭게 하는 행동 같기도 하다. 그들은 자국민을 살인하고 고문하고 극빈으로 내몬 이들이다. Instead of standing up to the threats of the North Koreans, the unification ministry has acted as a toady to Pyongyang. 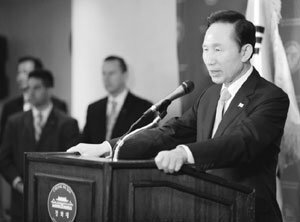 The unification ministry has not, in any public statements I have seen, extolled the freedoms enjoyed in South Korea to their counterparts in North Korea. More worryingly, some South Korean businessmen have, like the North Korean government, wanted to stop the balloon flights. They don‘t seem to realize their freedom to act as businessmen is a product of political system they enjoy. 북한의 위협에 맞서는 대신 통일부는 북한 정부에 아첨꾼처럼 행동하고 있다. 어떤 논평을 봐도 통일부는 북측 상대 부처에 대해 남한에서 만끽되고 있는 자유를 언급하지 않았다. 일부 남한 기업인들은 북한 정부처럼 대북 전단 날리기 행위를 중지하기를 원하고 있다. 그들은 자신들이 기업인으로 누리는 자유가 스스로 만끽하고 있는 정치체제의 산물임을 깨닫지 못하고 있는 듯하다. I do sympathize with the businessmen with investments in Kaesong. They now find their livelihood endangered after North Korea‘s decision to arbitrarily curtail business and tourism in Kaesong. But business is about making assessing risk. Political climates never remain the same. 물론 나는 개성공단에 투자한 기업인들을 동정한다. 북한이 독단적으로 개성에서의 기업활동과 관광을 제한한 뒤 그들의 기업활동이 위험에 빠졌다는 것을 안다. 그러나 비즈니스는 위험을 평가하는 것이다. 정치적 환경이 같을 수 없다. The ``sunshine diplomacy of presidents Kim Dae-jung and Roh Moo-hyun did not provide sunny skies for inter-Korean relations. The good faith these two men might have had toward North Korea was betrayed by Kim Jong-il who ordered the detonation of a nuclear bomb. It is not South Korea which has acted in bad faith toward North Korea, but rather North Korea who has acted in bad faith toward South Korea and indeed the international community. 김대중·노무현 전 대통령의 햇볕정책은 결과적으로 남북관계에 맑은 하늘을 제공하지 않았다. 김정일 위원장은 핵무기 폭파 실험을 명령하면서 이 두 사람이 북한에 대해 가졌던 신념을 저버렸다. 약속을 어긴 건 남한이 아니라 남한과 전세계를 배신한 북한이다. In light of this, the plea by the unification ministry to stop the sending of balloons filled with pamphlets denouncing the North Korean regime, short wave radios and clothing is baffling. South Korea is a democracy. It is the duty, surely, of any citizen enjoying the freedoms of a democracy to enlighten, help and agitate for those enslaved by a dictator. 이 점에 비춰볼 때 북한 정권을 비난하는 전단지와 단파 라디오, 옷 등을 담은 풍선을 북한으로 보내는 것을 중지시킨 통일부의 변명은 이해하기 어렵다. 남한은 민주주의 국가다. 독재자에 의해 통치되는 주민들을 교화하고, 도우며, 선동하는 것은 민주주의 국가 시민의 의무다.